Barbara Stewart is author of The Complete How To Kazoo and the prettiest, wittiest and zaniest member (Leader and Kazoo Keeper) of Kazoophony. 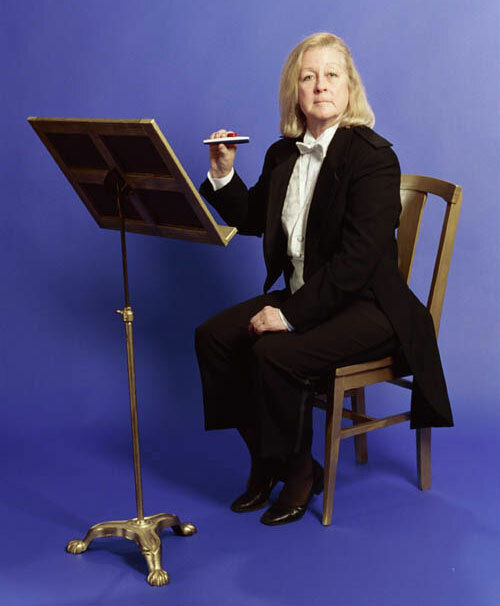 Barbara became a professional kazooist after studying at the Eastman School of Music, when master flute teacher Joseph Mariano told her that everyone ought to be an expert at something. She turned immediately to kazooing – where the field was wide open. She has appeared at Lincoln Center and Carnegie Hall, made numerous television appearances including on the Late Night With Conan O'Brien, Fox & Friends, Tonight Show, Martha (Martha Stewart Show) and performed with such artists as Frank Zappa, Arthur Fiedler and PDQ Bach. The Complete How to Kazoo also received mention from Andy Rooney on 60 Minutes and the book was chosen by Today Show critic Gene Shalit as one of the Top 10 Holiday Books for families and the young at heart. She made her singing debut at Town Hall with George Carlin’s Benefit Show for WBAI, when Kazoophony’s singer quit 3 days before the show. Barbara is a lady of many letters with a Cornell BA; Simmons (Library Science) MS; Columbia SOA (Playwriting) MFA; Tuck School of Management (Dartmouth) MBEP & AMBEP and with her daughter was the first “mom & daughter” together at Yale, as a Fellow in Design at the Yale School of Drama (FIDAYSD). She also has CEd. Diploma in Flute with honors (CEDDIFWH) and the record as longest-lived part-time student (38 years) at the Eastman School of Music. Barbara’s 4-octave coloratura singing range used to extend to the B-natural above second C, where she ran out of letters. Barbara Stewart in performance. 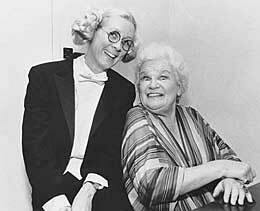 Photo by John Menihan Jr.
Barbara Stewart with the opera satirist Anna Russell, backstage at Carnegie Hall. Photo courtesy Arthur Shafman Intnl Ltd.